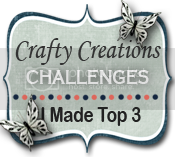 The new challenge at Come and Get It is: Animals, meet Flower Pot Frog, he is a digital from Oak Pond Creations, they are sponsoring this challenge. They do have a fun selection of digis to choose from and who could resist this sweet little character. I hope you'll come by and share your creations with us. 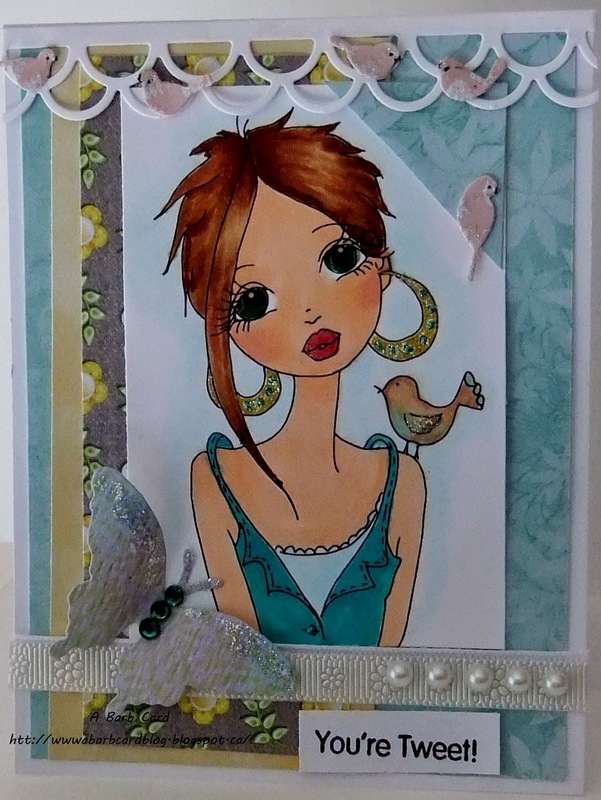 This little darling is from Digis Stamp 4 Joy, her name is Selene. I finished her up last night and decided to enter her into a few challenges. Colored with Copics, the cute little bird cage was given to me by a friend, Stickles, Glossy Accents, EK Success punch, MFT dies, the 2 sentiments are stamps from my stash with Archival Ink, Flower Soft in her basket and a few gems. This is Nicoloisa Venice Girl a digital stamp from the Lacy Sunshine Shoppe, a fun stamp to color. 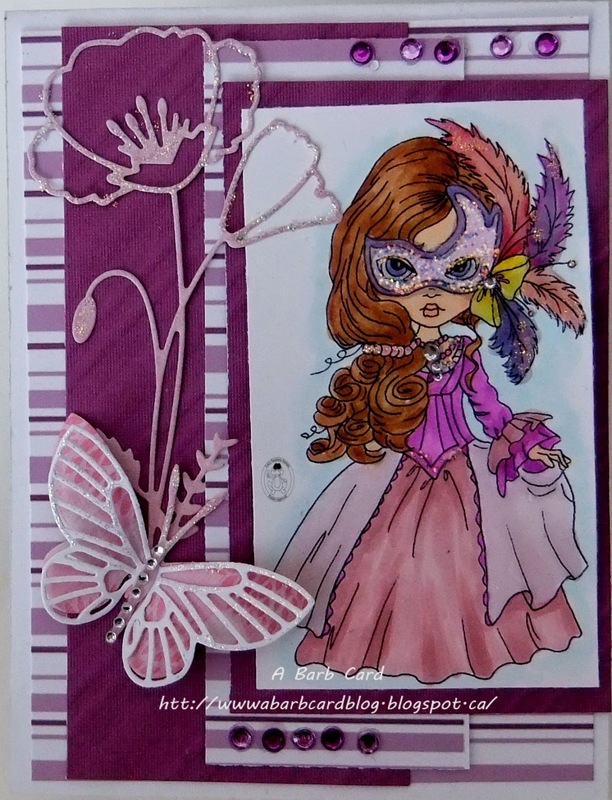 I'm supposed to say why this is my favorite stamp but all I can say is it is 1 of my favorite stamps, I love her clothing, mask, feathers, hair. 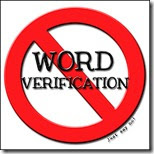 Stamping for over 20 yrs now I have LOTS of favorite stamps both rubber and digital. This is Lucy Loo having her morning coffee, she is a digital stamp from East Wind Digital Stamps, there you will find a great selection of some fabulous characters. This is another of my favorite stamps as I love how she is sitting, drinking her coffee with her cat in her lap and her slippers are my kind of slippers. I won't go into the long story of finding a mouse in one of my high top runners at 6AM one morning scared the, well just really scared me. What better way to celebrate a 2 year old Birthday than with double/triple scoops of ice cream. This is Eleanor and Pickles, a digi created by Heather Valentin and it is their 2 yr old birthday. 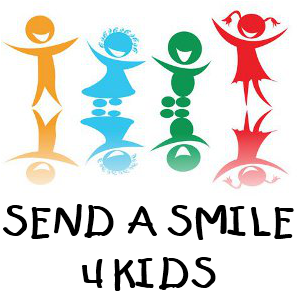 You can find them here at the Lacy Sunshine Shoppe along with many of their oh so different friends. 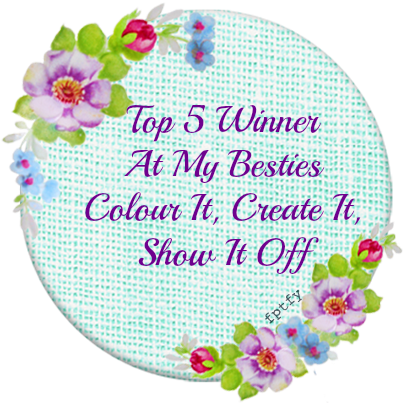 Labels: Copics, cuttlebug & Big Kick, gems, glitter, glossy accents, Spellbinder dies, with a couple of punches. The new challenge this week at The Come And Get It is: Colors, Calypso Coral, Baked Brown Sugar and Pool Party. 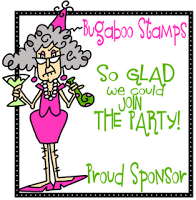 Our sponsor this week is Bugaboo Stamps, where you can find a fabulous assortment of images to choose from. I chose Bear Present to work with and what a fun little fellow he is. 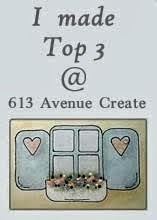 I hope you'll come join us so we can visit your creations and you may be one of the lucky ones. This is Tiny Eveninpuff, a HobGobbi created by Heather Valentin at Lacy Sunshine Shoppe. 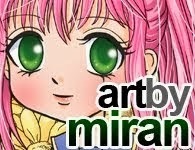 She gave one to all the member who belong to her FB group for a contest being held there. Well this is what I've done with the little one, I thought a garden would be a nice place for Tiny to hang out with nature. I created the background using Distress inks with sponges. 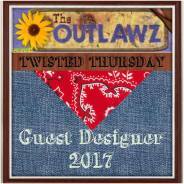 A Day for Daisies, one of our sponsors this week and the other being QKR Stampede. Both of these generous sponsors have a wonderful selection of images for you to choose from, I hope you stop by their online shops. 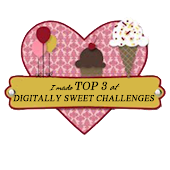 I hope you'll come join in at the challenge as we enjoy seeing your creativity. 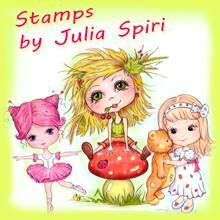 This is a digi from Digi Stamps 4 Joy, I think they have a fabulous selection of images to choose from. I thought the little bird on her shoulder is adorable and I really like her earrings and summery outfit. This is Rory with Clover a digi from the Lacy Sunshine Shoppe, I like hats and her hat is just so cute. She reminds be of just relaxing, enjoying the bright summer sunshine in the country. This cute couple are Zanni and Zelda from the Lacy Sunshine a bonus for subscribing to her new online magazine. They were just too fun to color. 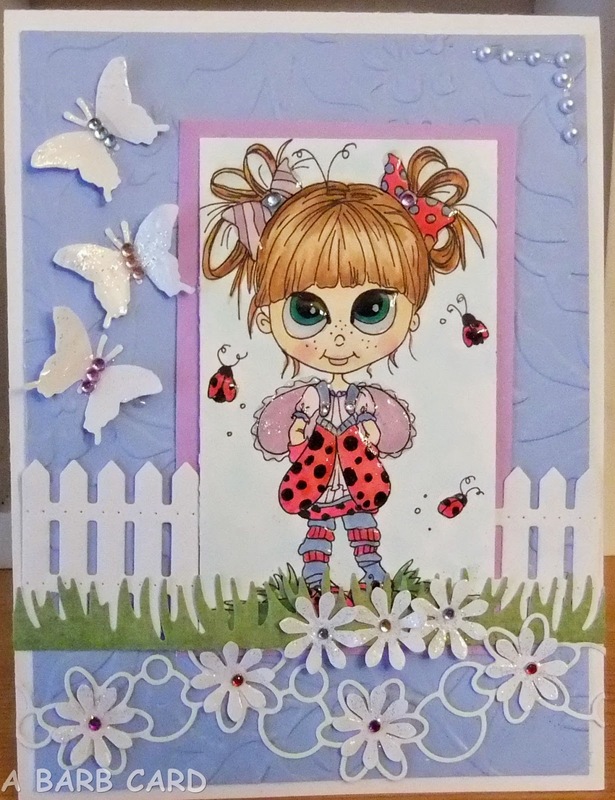 This little charmer in the garden is Misteri, she is a digi from Digi Stamps 4 Joy, they have a great selection to choose from. This is Maddie Haddie Steampunk a digi from the Lacy Sunshine Shoppe, I made this one for the challenge on the Lacy Sunshine Challenge Blog, the theme being Goth and or non traditional hair color, I think this fits the theme. I'm not really into Goth and I still struggle with traditional hair colors but had to give it a try. Through the Purple Haze has a challenge themed Show Me Attitude, hmmmmm think this may fit. 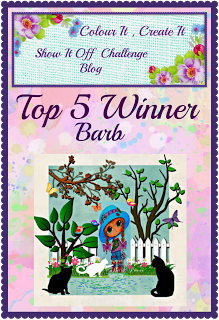 This is Abigail lil Angel a digi from the Lacy Sunshine Shoppe, that I've chosen to use for my DT card for the Come And Get It challenge this week. 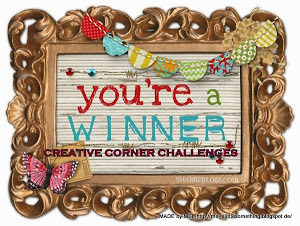 The theme being Recipe: A Square Card use One Circle, One Ribbon and 2 DP (design papers). I hope you'll come and join us. Meet Ladybug Lindsay, she is a digi from Lacy Sunshine Shoppe, I thought she is so adorable with that happy little face. Colored with Copics, Memory Box dies, Martha Stewart punch, Carl's Craft punch (flowers), Glossy Accents, Crystal Fine gltter, gems, pearls, cs embossed with Cuttlebug. This little digi is from Whoopsi Daisy, I like her style so thought she'd be fun to color and she was. Colored with Copics, layered to cs by First Edition, Memory Box dies, EK Success Punch, Stickles, Glossy Accents and a few gems. This charming image is Seniors on Vacation, by Milk and Coffee where you can find a wonderful selection of images. Colored with Copics, layered to cs embossed with Cuttlebug, Glossy Accents, Memory Box dies, Stickles, Crystal Fine Glitter, flowers punched with a Carl's Craft punched, sentiment from my stash, few gems and pearls. Colored with Copics layered to cs by BJ Mar, Frame, image and butterflies are "popped up" with double sided foam tape, embossed by Cuttlebug, Spellbinders die for the frame, Memory Box dies, Glossy Accents, Stickles, Crystal Fine Glitter, gems, sentiment from my stash. This little charmer was given to the group and I couldn't wait to color her. She is Aurora Gardening from East Wind where they have a fabulous selection of images to choose from. I've colored her with my Copics, added a few die cuts, gems, a punched butterfly, Glossy Accents, Stickles. 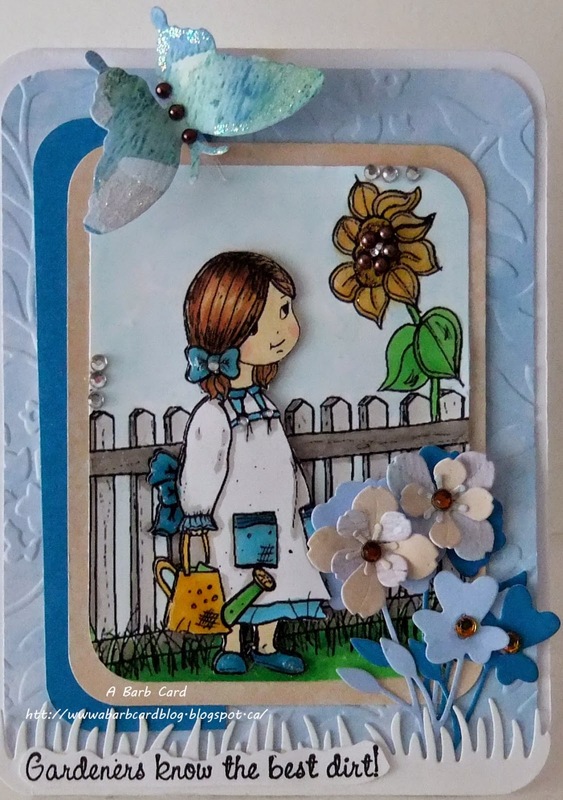 This little charmer is from The Stamping Boutique, named Sunflower Girl, so adorable I couldn't resist having her. Colored with Copics, I layered her on top of the first image for dimension. Embossed with my Cuttlebug, die cuts from Memory Box, Glossy Accents, stickles and lots of "dots" AKA gems and pearls. 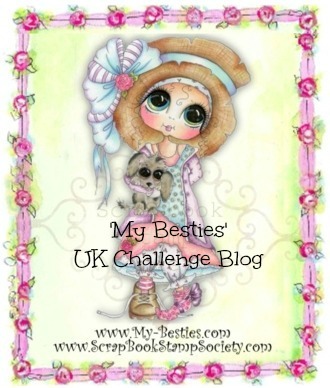 This is Fairy Berry, a digi from East Wind Digital Stamps, they have such beautiful images to choose from. 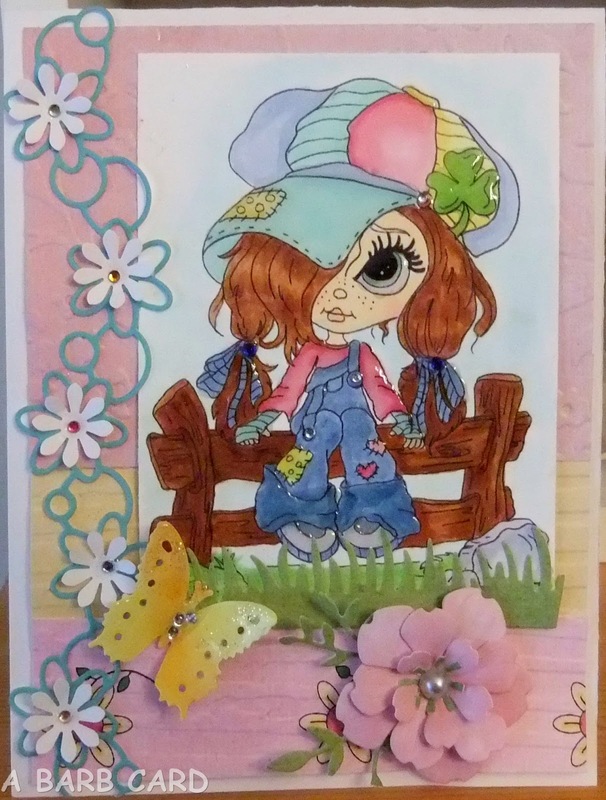 I colored her with my Copics, layered to card stock, the flower and vine are die cuts from Memory Box, the butterflies punched with EK Success punch, some gems, Glossy Accents and Stickles were added.